Native or Non-Native English Teachers: Who's Better? A topic of great discussion is whether native or non-native English speakers make better teachers. However, in defining the word "better", many factors should be discussed including pronunciation, teaching style and techniques, understanding of foreign cultures, personality, attitude, and passion for teaching. Personally, as a language teacher, I often hear students say that they can't understand the accent of non-native teachers here in the US, always comparing their accent to my own, standard, accent, but these students often are surprised to learn about and hear the wide variety of accents in the US that sound "foreign", but which are just part of this country. So, what do you think about this topic? Please share your thoughts and experiences. Tatoos: Are they popular in your country? The popularity of tatoos tends to come and go in certain places around the world, but are they culturally acceptable in your country? Do men and woman have them? Are there certain symbols or pictures that are most common? What would your parents think if YOU had one? Share your ideas on this topic. 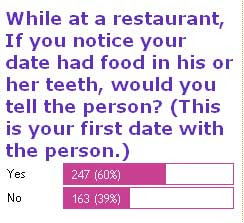 In one of my polls, I asked whether a person would tell their date if he/she had food in their teeth, and four out of ten people said they wouldn't. So, what factors affect our inability or unwillingness to say something in this situation? How would you feel if you were the other person? How would you feel if you were the other person and later found out that you were walking around for hours with a piece or carrot in your teeth? Does culture have anything thing to do with how open we are towards others in relationships? Please share your ideas. Perhaps the most common question I am ask is how students can learn English better and faster. This is a difficult question to answer because there are many factors that affect learning. While many people thing of motivation and study skills, one perhaps overlooked factor is natural ability. To be honest, I have taught many students over my 20 years as a language teacher, and some students have a natural sense for learning and picking up a new language with relative ease as compared to others. In addition to this, what other factors affect learning? Share your opinions and experiences on this topic. Culture Tips: What should people know? If someone came to your city in your country to visit, what is one thing they should know about it in order to adjust quickly and not make any cultural mistakes? For example, I live in Utah in the United States, and the citizens of the state, by and large, are conservative. In fact, many people don't drink alcohol or drink coffee for religious reasons. Thus, you shouldn't give such items as a gift when visiting many homes. The best thing to do is to ask others living in the area what would be an appropriate gift. So, tell us something that people ought to know about your culture before they arrive? Share your ideas. Accent Reduction: Is it possible? Many students are concerned about reducing their accents, but how much reduction is possible? I always tell my students that eliminating a foreign accent is really impossible because, to be honest, all native speakers have accents. So instead, the goal should be to reduce your accent. One way is to learn how to do word reductions like, "I wanna go ta the party taday." Of course, you have to make sure you know under what situations reducing is desirable, but students should at least become aware of this. With this in mind, I created a Website called Train Your Accent (www.trainyouraccent.com) to provide a resource for students and teachers to use. Please share other Websites you know about improving pronunciation and any other tips you have about accent reduction that would helpful to other students. Also, feel free to share your ideas on these issues or personal experiences. Adulthood: At what age should children move out? When do you think adult children (over 18 years old) should move out and live on their own? And if they stay at home, should they pay parents rent? Why or why not? Personally, I feel that children need to learn how to develop the skills to live on their own, and even paying for rent can help them develop self-reliance. But, do these feelings differ from culture to culture? Share your ideas on this topic. Time Machine: If you could go back . . . If you could go back in time to any point in history, when and where would you want to go? Personally, since I enjoy family history, I'd like to go back to the time in the late 1920s when my grandparents first met and observe their courtship and marriage. Then, I could write about it and share it with my own children. Favorite Music: What do you like and why? With so many types of music to choose from, there is something just about for everyone. Personally, I enjoy listening to jazz and country western music. I find both of them soothing and often inspirational, especially when the song has a message that lifts the spirit. One particular song I have enjoyed is "Anything" by Martina McBride. In the song, she says that even when life gets difficult, we have to move forward and do things anyway. So, what about you? What kind of music do you like and why? Do you have a favorite song, and if so, why do you like it? Please share your ideas. 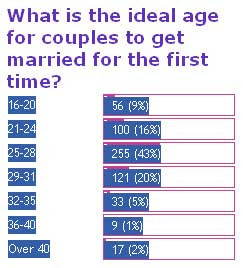 Marriage: What is the Ideal Age? Many people have different opinions on dating and getting marriage, and one of them deals with the ideal age for getting married. Some might argue that dating longer and waiting until you are more "mature" and settled is best, while others might say that marriage at any age can work. What do you think? Share your feelings and experiences on this topic. Please tell us where you are from and what opinions people have in your country. Is there an ideal age for marriage? In my poll of more than 800 people, by far, visitors indicated that listening was the one skill they wanted to improve most during 2008. The question, then, is how can learners best improve their listening skills? Of course, there are Websites, like my own at www.esl-lab.com, where students can practice online, but what other ideas can you think of? Share your ideas. 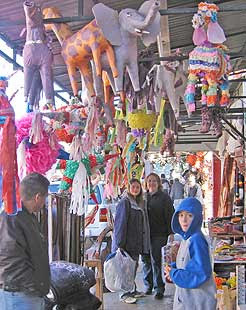 This past Christmas vacation, my family and I went to a border city in Mexico for the day and had a fun time shopping for a few small gifts for family. I told my children that they could try bargaining with the shop owners since that is the custom there, particularly with tourists. When we went into some of the shops, the owner would give us a very high price for an item and then immediately drop the price at least half. Then, if we were interested, we could negotiate a better price. In some cases, we would walk away if the price was still too expensive, and then some shop owners would drop the price even lower to get us to return. So, what about in your areas or countries? Is bargaining consider appropriate when shopping? In what cases and in what situations can you do this? Share your experiences either in your countries or where you have traveled.